Looking for specific location information or to contact us by phone? 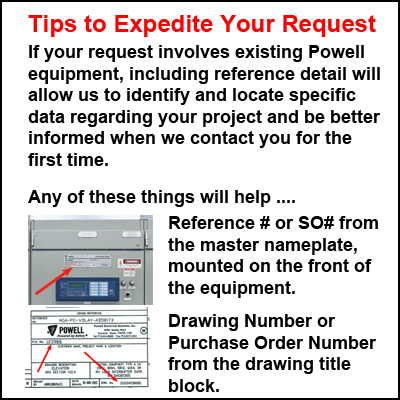 ​In using Powell Industries, Inc. (“Powell”) Contact Us query, the entrant (“You”) consent that by clicking “Submit”, Powell can collect the information provided, via an online form. This information includes: your name, email address, telephone number, Company name, Region and any other personal or sensitive information provided in the Query/Comment box. Information will be stored on Powell’s internal company intranet, accessible to the Web Administration Team, for no longer than two (2) years. Powell has a legitimate business interest to collect and process personal data in relation to general queries. Using the information provided by You, the Web Administration Team may distribute the query to the appropriate internal employee(s) for the purpose of processing; this employee may contact You using the information provided. Powell will not use your data for any purpose other than that for which You have contacted us. At the end of the two (2) year period or once You withdraw your consent; your data is deleted or destroyed. Thank you for your interest. Your query/comment has been successfully submitted.